Sheep and ponies graze a number of important conservation and ancient chalk downland areas in the city. Grazing improves the open space for wildlife and people. Follow @BHSheep on Twitter for up-to-date information on where the livestock are grazing. You can find the areas where grazing takes place on our grazing map. Grazing is better than mowing for the land as the grass and plants are grazed over several weeks. removes different plants at different rates, unlike mowing where everything is removed at once. Sheep find some plants tastier than others! Volunteers check the sheep and ponies regularly. Our city livestock need more checks than livestock further out in the countryside. If you would like to help, you can volunteer as a Lookerer (volunteer livestock checker). 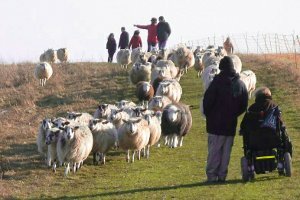 Downland, or chalk grassland, has developed over many centuries of sheep grazing on the chalk hills of southern England, particularly around Brighton & Hove. The corn was grown in the valleys on the more fertile soils and the sheep grazed on the hills where the soils were thinner and less fertile. The sheep were brought down from the hills each evening by the shepherd and their dung manured the field allowing it to be cropped again the following year. This meant that the fertility of the hill soils was kept low by the continual transfer of sheep and the downs became rich in a very special diversity of wildflowers and insects such as butterflies. Over the last century agriculture has become industrialised and, with the introduction of artificial fertilisers, no longer dependent on sheep grazing. This has seen 97% of the flower rich downland grassland disappear in the last century. The remaining 3% is under threat from spreading scrub (for example nettles). In order to reverse this decline the council has reintroduced grazing as part of our work to expand and conserve chalk grassland in and around the city. Conservation mowing is carried out as a temporary measure to prevent scrub from becoming established on important chalk grassland sites currently not suitable for grazing. Mowing is not the best management for conservation areas as it is relatively destructive to wildlife and it is expensive to collect and compost the cuttings.